TACLOBAN, Philippines John Lajara peers under a slab of crumbled concrete, lifts a sodden white teddy bear then drops it back into the filth. He reaches again into the rubble and pulls out a boot, a treasured find in this typhoon-flattened village. But he's searching for something far more precious - the body of his brother, Winston. For those still looking for loved ones missing since last week's storm, their already torn-apart lives are shot through with a difficult question - How do you move on when there is no body to bury? The search for the missing - 1,179 by official count - has become a hellish daily activity for some. In Lajara's seaside village, residents estimate that about 50 of the 400 people who lived there were killed. About half of the dead are still missing: mothers, fathers, children and friends. "Somehow, part of me is gone," Lajara said as another fruitless expedition in the rubble ended Saturday. Lajara has carried out the routine since both he and his brother were swept from their house by Typhoon Haiyan on Nov. 8. And every day has ended so far with no answers on Winston's fate. According to the latest figures by the Philippines' main disaster agency, 3,633 people died and 12,487 were injured. Many of the bodies remain tangled in piles of debris, or are lining the road in body bags that seep fetid liquid. Some are believed to have been swept out to sea. After the initial days of chaos, when no aid reached the more than 600,000 people rendered homeless, an international aid effort was gathering steam. "We're starting to see the turning of the corner," said John Ging, a top U.N. humanitarian official in New York. He said 107,500 people have received food assistance so far and 11 foreign and 22 domestic medical teams are in operation. U.S. Navy helicopters flew sorties from the aircraft carrier USS George Washington off the coast, dropping water and food to isolated communities. The U.S. military said it will send about 1,000 more troops along with additional ships and aircraft to join the aid effort. CBS News' Seth Doane reports from the disaster zone that, with each passing day in Tacloban, more evidence of progress is seen on the ground. Streets are being cleared, bodies are being buried and food distributed. Daily routines resume amid the rubble as people try to grasp a new reality. "If is this a dream, I should wake up," said Corazon Mabahin, who lives on the outskirts of a place called Palo Leyte, just a few miles from Tacloban. Her house now is just a pile of bamboo. All that's left is a crib, some clothes and a handful of spoons after the typhoon tore through. As the typhoon picked up, Corazon got a text message from an American, Elsa Thomasma, who encouraged her to flee to a community center she'd built next door. 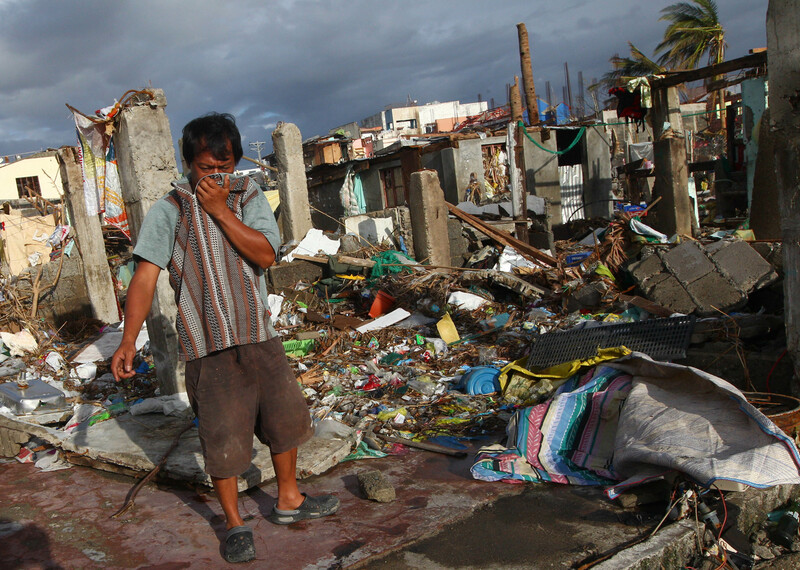 Haiyan's winds destroyed homes in Elsa's neighborhood of 300 people, but there was not a single death in the neighborhood. Many took refuge at the center. The focus of the aid effort is on providing life-saving aid for those who survived, while the search for missing people is lower in the government's priorities. The head of the country's disaster management agency, Eduardo del Rosario, said the coast guard, the navy and civilian volunteers are searching the sea for the dead and the missing. Still, he said, the most urgent need is "ensuring that nobody starves and that food and water are delivered to them." Lajara's neighbor, Neil Engracial, cannot find his mother or nephew, but he has found many other bodies. He points at a bloated corpse lying face down in the muddy debris. "Dante Cababa - he's my best friend," Engracial says. He points to another corpse rotting in the sun. "My cousin, Charana." She was a student, just 22. Lajara remembers the moment his brother vanished. They were standing alongside each other side by side with relatives and friends before the surge hit. They stared at the rising sea, then turned to survey the neighborhood behind them, trying to figure out where or if they could run. Then the wave rushed in. Lajara, Winston and the others dived into the water, and were swept away from each other. After Lajara's face hit the water, he never saw Winston again. Lajara has trudged through the corpse-strewn piles of rubble and mud, searching for two things: wood to rebuild his home, and Winston. So far he has found only wood. On Saturday, he set out again. The rat-a-tat-tat of a snare drum echoed across the landscape, as a young boy played the instrument from the roof of a gutted building. It was a grim accompaniment to what has become Lajara's daily march into the corpse-strewn wasteland that was his home, where the sickly sweet stench of death mixes with the salty sea air. Reminders of the people who once lived here are wedged everywhere among the warped piles of wood, glass and mud: a smiling, bowtie-clad stuffed bumblebee. A woman's white platform shoe. A wood-framed photograph of a young boy. Suddenly, a neighbor, Pokong Magdue, approached. Magdue replies: "We saw him in the library." Lajara shakes his head. It can't be Winston. He's already searched the library. Sometimes people come to him and inform him that Winston's body has been found. Lajara must walk to the corpse, steel himself, and roll it over to examine the face. He then must deal with conflicting emotions: relief that the body is not his brother's. Hope that Winston might still be alive. And grief that he still has no body to bury. Because at least then, he says, he could stop searching. Winston was his only brother. He had a wife and two teenage children. He was a joker who made everyone laugh. He drove a van for a living and was generous to everyone. He was a loving father. "It's hard to lose somebody like him," Lajara says. Now, the only trace of his brother that remains is his driver's license: Winston Dave Argate, born Dec. 13, 1971. 177 centimeters tall, 56 kilograms. The upper left-hand corner of the license is gone, and the picture is faded. Lajara leaves it with a friend for safekeeping when he is out hunting for wood and Winston. He gazes at the card in his hand. "When I want to see him, I just stare at his picture."